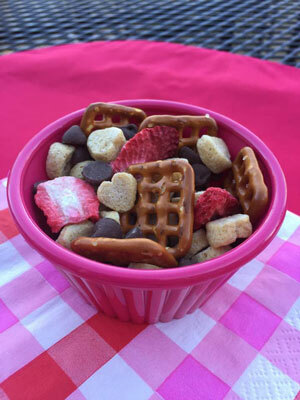 Try this quick, healthy snack at home or for your child's Valentine's Day party. The heart-shaped cereal makes it cute and fun to munch! Feel free to change ingredients to whatever you have on hand. Wash hands with soap and water. Stir together all ingredients. Store in an airtight container. Makes 11 servings (1/2 cup each). Each serving contains: 118 calories, 4 g fat, 21 g carbohydrate, 2 g fiber and 132 mg sodium. Note: This snack is intended for children over age two. Do not serve to younger children who may be at risk for choking. Was this newsletter helpful to you? If you share this newsletter, how many will you share it with? How will you share the article? If you stated other, how do you plan to share it?